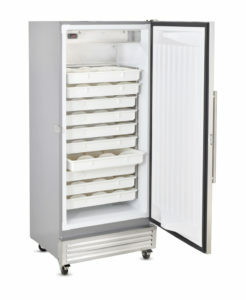 Meet Our All New RD-10 Series Refrigerated Dough Retarder Cabinet! 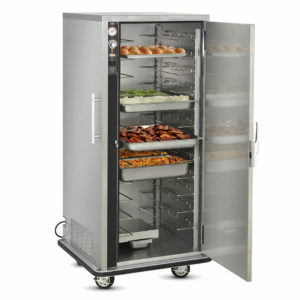 Today Food Warming Equipment proudly presents the Refrigerated Dough Retarder! This new product is fresh off the FWE assembly line and is ready to serve you and your customers. Manufactured to ensure consistency in your dough rise as well as promote complex flavor development that excellent airy structure in pizza crust. 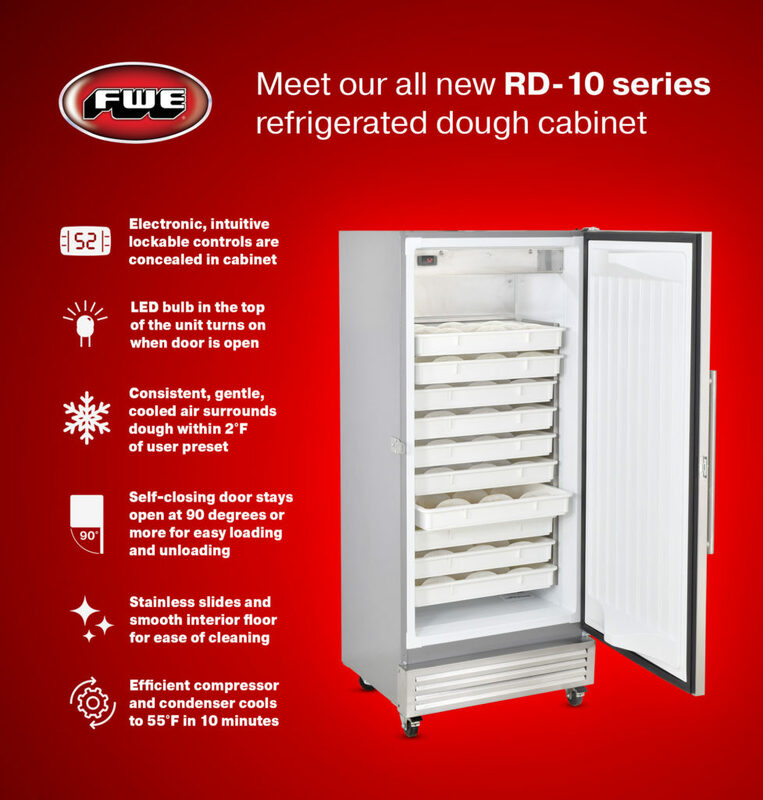 The newest addition to our very popular refrigerator line the Dough Retarder fills an important place in FWE’s goal to help our customer’s craft the perfect pizza. 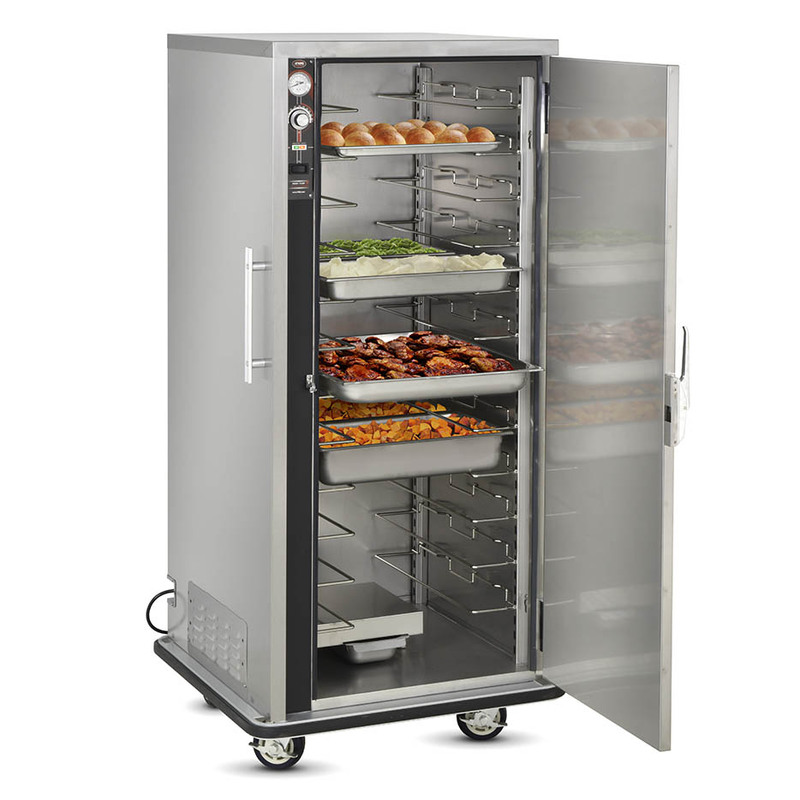 Made of the reliable construction FWE is known for, the Refrigerated Dough Retarder is both strong and easy to use. Electronic concealed controls located inside the cabinet prevent accidental tampering. 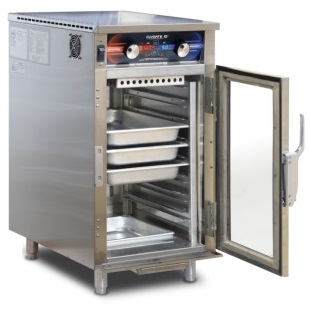 The unit is equipped with a self-closing door that stays open at 90 degrees; the Refrigerated Dough Retarder ‘s door will never get in the way of trying to use it. 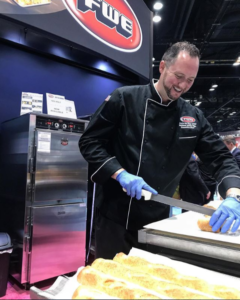 We’re back from #NRAShow2018 – we are #FiredUp to share the details! 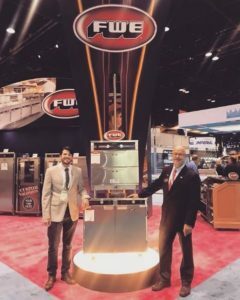 Food Warming Equipment Company recently returned from the National Restaurant Association Show in Chicago, IL. 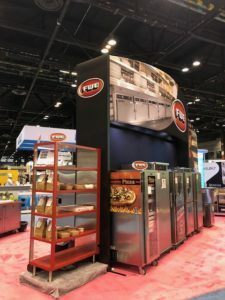 This year FWE unveiled new products and updates to existing lines. Brand new products like the innovative Clymate IQ® Drawers. National Sales Manager, Travis Hartley, at NRA! 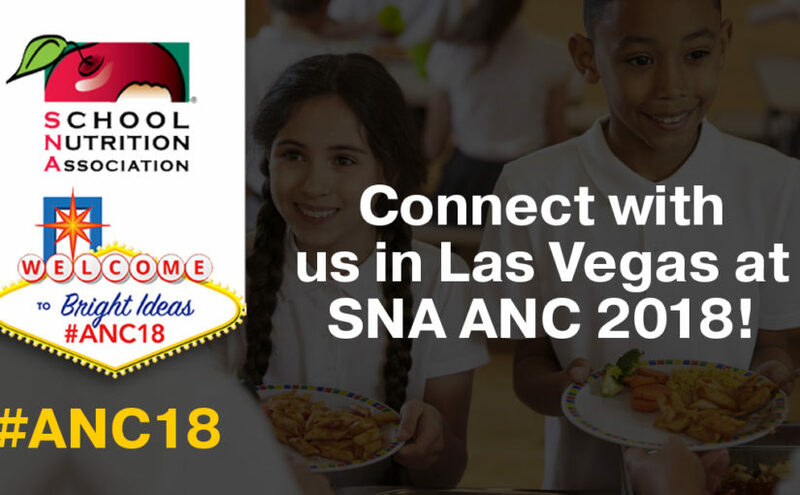 Every year, the NRA show hosts thousands of professionals from all across the food service industry. FWE is proud to have a large presence at this show, so close to our corporate headquarters and sales office in Crystal Lake, IL. Thank you to each and every person that stopped by our booth to learn about what’s new at FWE. This year we were excited to announce the Clymate IQ® Precision Heated & Humidified Holding Drawer! The new series of FWE Drawer Warmers employs the same Precision Holding Temperature Technology (PHTT) found in all of our best-selling Clymate IQ® series of cabinets. Available soon, with a selection of single, double or multiple drawer versions. Contact us for further details. FWE has many designs and styles to accommodate the standard 12″ x 20″ shallow pans, and pans up to 6″ deep. Standard and Side Load designs allow for narrow or shallow openings against walls and counters in the kitchen. 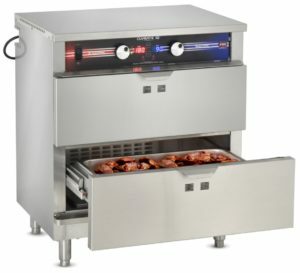 FWE / Food Warming Equipment Company, Inc. • Also New! 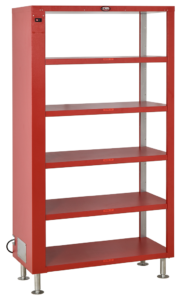 • Heated Holding Shelves – New Features & Options like Individual Control Switches, Color Powder Coating & More! you have come to expect with FWE products. These warming drawers hold vegetables, potatoes and pasta hot, moist and flavorful. 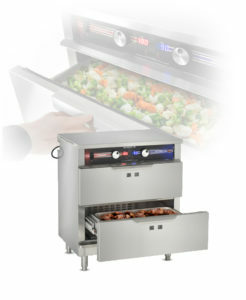 Stage hot beef, pork, poultry, and fish and retain flavorful juices at the precise temperature and humidity that you set. The Drawer is great for concession stands, convenience stores, quick service restaurants, bistros & cafes, cafeterias, country clubs, nightclubs & bars. To see additional new items and features, join us on our What’s New page over at www.fwe.com/whats-new! 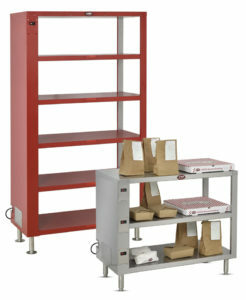 More variety in our latest radiant Heated Holding Shelf (HHS). Solutions for Take-Out and Online Food Ordering Services. 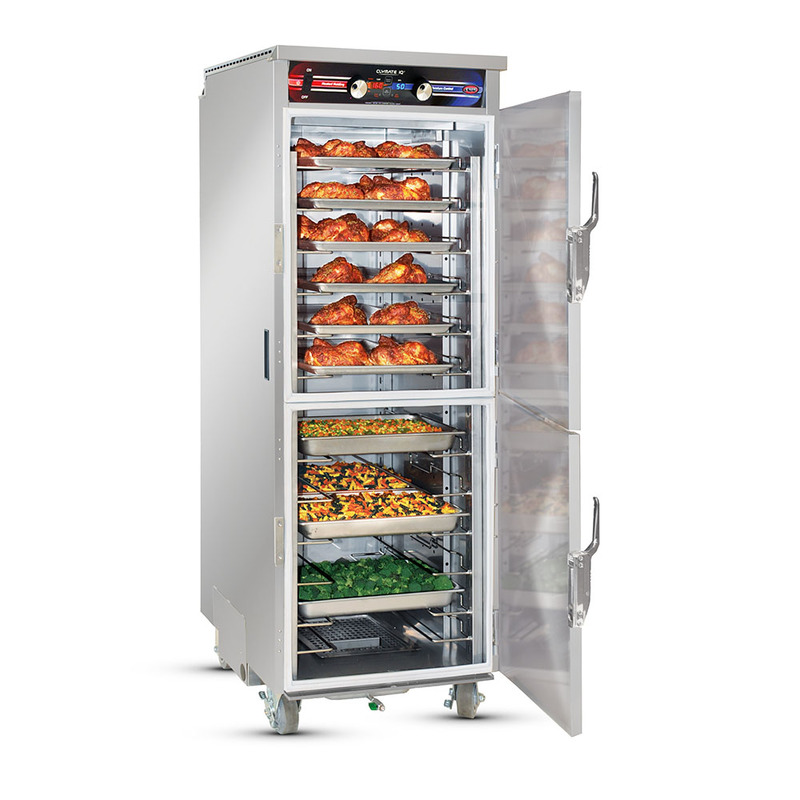 Recently introduced, Food Warming Equipment (FWE) now offers more variety in radiant heated holding shelving solutions with new styles and features. New Sizes & New Styles available. Explore New Colors with powder coating. 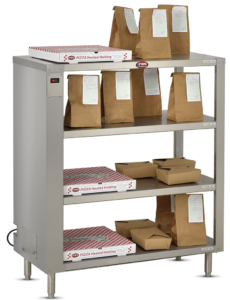 The HHS series of radiant heated shelving was designed to address the needs of Grab-and-Go and Take-Out operations. 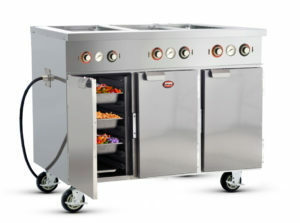 Perfect for fast-food chains, Quick Service and Fast Casual Restaurants. Now available in various sizes and styles. We’re sure to find the right fit for almost any application. Click Here for more detailed information on features and options. 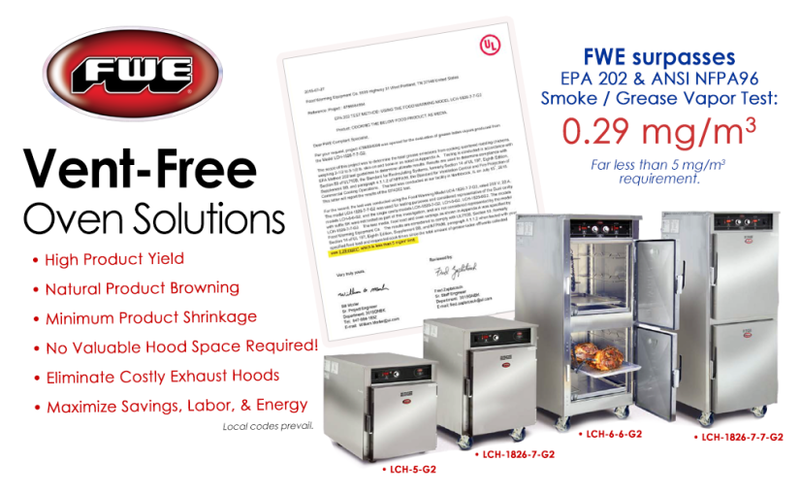 Call (800) 222-4393 to speak to an FWE Foodservice Professional. Available soon, a selection of single, double or multiple drawer versions. Already, FWE has many designs of several styles to accommodate the standard 12″ x 20″ shallow pans, and pans up to 6″ deep. All stainless and built with the commercial durability you have come to expect and depend on with FWE products. Check out the latest new and improved products and designs fwe has to offer at www.fwe.com/products/whats-new. 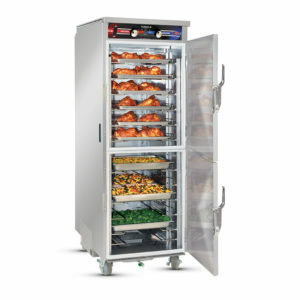 There are now Vent-Free Oven Solutions available from FWE! 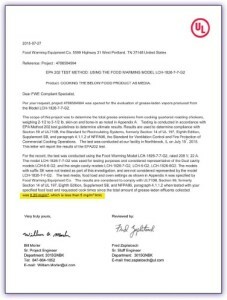 Food Warming Equipment (FWE) is pleased to announce that the new generation (G2) of low Temperature Cook & Hold Ovens, has passed a capture and emissions test, based on U.S. Environmental Protection Agency (EPA) Test Method 202. Conducted to ensure the emission of grease-laden effluent does not exceed an average of 5 mg/m3 during an eight-hour test cooking period. Total grease emissions are far less than required and FWE far exceeds the Standard for Recirculating Systems for Ventilation Control and Fire Protection of Commercial Cooking Operations. With less than 0.29 mg/m3 the new generation of Cook and Hold Ovens passes this Smoke/Grease Vapor Test with flying colors! 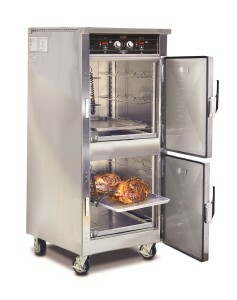 FWE’s LCH-G2 ovens prevent grease-laden vapors and smoke from escaping without the use of costly exhaust hoods. You can cook almost anything anywhere and achieve high product yield, natural product browning and minimal product shrinkage. Maximize savings, labor and energy and eliminate costly and space-consuming exhaust hoods. In taking action to protect the environment — we can make a difference as every action counts! In FWE’s effort to reduce greenhouse emissions, a larger understanding of Corporate Social Responsibility (CSR) became apparent. CSR is an effort to make a significant contribution towards sustainability and competitiveness, an integrated social and environmental concept in lowering a carbon footprint of a company. FWE is proud to be a socially responsible corporate enterprise by reducing the company’s overall impact on the environment through the reduction of natural resources and energy, as well as strong recycling and other efforts. To learn how we are doing business differently to impact our communities in a socially responsible way, as well as ways you can help, view our plan of action on our Community & Sustainability page at FWE.com. Company-wide, FWE is actively looking at ways to reduce our carbon footprint and favorably impact our products and environment. 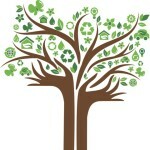 Make an effort to support Corporate Social Responsible (CSR) companies and consider a lower carbon footprint lifestyle. Did you know, for example, the burning and clearing of tropical forests is a major – though often unrecognized – source of greenhouse gas emissions? It accounts for roughly 16% of total global yearly emissions, more than the yearly emission all of the world’s cars, trucks, ships, trains and planes combined. Please consider in joining us in “Protect an Acre” with Conservation International, a global non-profit organization dedicated to the responsible and sustainable care for nature, and the well-being of humanity. As part of our commitment to sustainability and improved practices, we continue to certify more and more products to the Energy Star standard. In doing so we enable customers to make the right decisions that allow them to save money, energy, and natural resources, and meet ever increasing environmental standards. 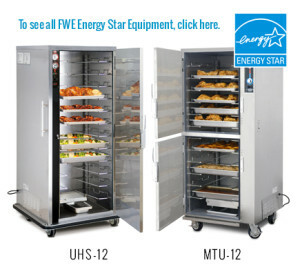 As such, Food Warming Equipment Co. is proud to display the Energy Star seal and share the products of our innovation. Restaurants consume one-third of all retail electricity used in the world in addition to consuming a tremendous amount of gas and water as well as producing a large volume of waste. FWE engineered products help with the conservation of energy and water while typically decreasing the amount of wasted food product that would otherwise find its way into the landfills. By producing high-quality, energy efficient industry leading products, FWE helps reduce customers’ energy costs as well as lower food costs associated with waste. 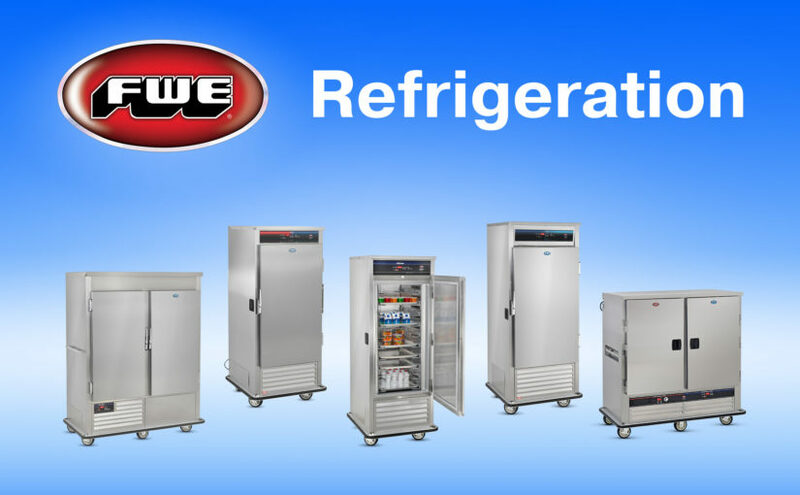 FWE manufactures many Energy Star rated products and even products that are not marked with the Energy Star logo are often times meeting or exceeding those requirements. This not only helps our customers, but crosses boundaries to all that share our planet. 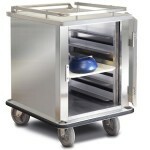 EZ Glide – Quiet Ride Patient Delivery Cart (ETC-1520-10), with sound buffering components and smooth, agile handling. Providing maximum reliability for hushed environments that require concentration and tranquility. FWE hosts a vast array of solutions for the challenges Hospitals and Healthcare Facilities face. A feature list of the first two in the ETC PATIENT TRAY SERIES 2 can be found here for the ETC-1520-10 and the ETC-1520-24. Available in several tray capacities. Contact Sales today at sales@fweco.net for details and upcoming information on the New Evolution in Quiet Mobile Carts and Cabinets. 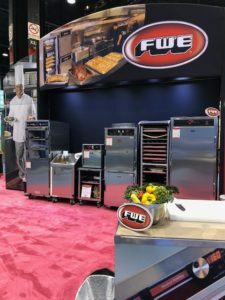 FWE will roll out its new model by introducing a new compact Precision Humidity and Temperature Technology, Heated Holding Cabinet (PHTT-1220-8). This compact unit can be safely placed on counter tops. 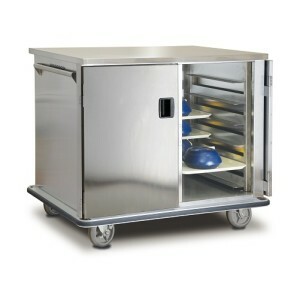 With a switch of legs to caster wheels this unit may be mobilized to roll under some counter tops. Also perfect for transport, this compact heated holding cabinet can easily ship in vans and food trucks to catered events. With Precision Humidity and Temperature controls you can lock in the snap of crispy fried foods, keeping them fresher, longer, without worrying about them turning soggy or overcooked. 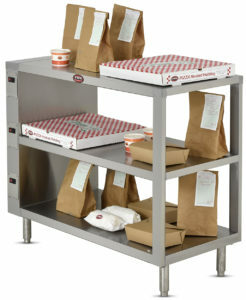 Come see this cart and more at the upcoming NRA Show at Chicago’s McCormick Center on May 17th – 20th.